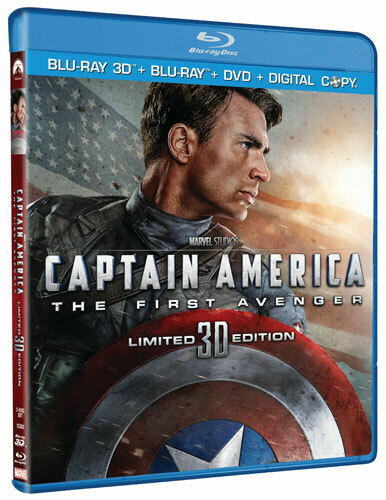 Captain America: The First Avenger tells the story of Steve Rogers (Chris Evans), an average man from Brooklyn, New York. Smaller in size and strength than the typical soldier, Steve wants nothing more than to join the army and defend his country. Unfortunately, his aforementioned stature results in the army rejecting him 4 separate times. After the 4th rejection, Steve is noticed by Dr. Abraham Erskine (Stanley Tucci) who informs Steve he just may have something to make him the man the army is looking for. Steve is selected to undergo a new ‘serum’ treatment. Enlisting him as a new “super-soldier” project, Steve is put under the ranks of Erskine, Colonel Chester Phillips (Tommy Lee Jones) and Peggy Carter (Hayley Atwell). At first unconvinced of him due to his physical size, Phillips and Carter are soon made to believe Rogers just may be the man they need. The treatment is a success but for every success comes a price. Erskine is killed by an undercover agent, loyal to Johann Schmidt (Hugo Weaving). Now Captain America and his allies must figure out where Schmidt is and exactly what he’s attempting to do. What results is one of the better comic based films in recent time. Having seen Thor earlier this year, I exited the theater confidently declaring that was the best Marvel film I’ve ever seen. Thor hit all the notes exactly right. Acting, Direction, Score, Effects, everything. Then came along Captain America. I wasn’t completely sold on the film mainly because of Director Joe Johnston who has made a few good film (Jumanjii, The Rocketeer), but has also made a few stinkers (Wolfman, Jurassic Park III). After seeing Captain America, I can still say that Thor is the better film but not by that much. Simply put, Captain America is what comic book films should be like. Akin to that of another Marvel film in Iron Man, Captain America is funny, serious, well acted, directed and shot. As I mention below in the Video Quality section, Johnston and his director of photography Shelly Johnson have a keen eye for how the action sequences should play out. Never are they over-the-top, but more right in line. Almost playing right out of the comic book. On the acting front, I found everyone from Chris Evans as the lead to the always excellent Stanley Tucci as Dr. Erskine all played their parts well. I’ll easily admit that my first introduction to Evans was courtesy of the Fantastic Four series, where he was an okay addition but nothing overly great. While he hasn’t gone on to do THAT much outside of this film, he certainly has a bright future ahead of him as he acted this part quite well handling drama, humor and action all in a manner that was convincing. Hugo Weaving…. I don’t really need to say much here. Weaving is always fantastic in whatever role he tackles. Whether it be the acting, the direction, the action or simply the story, Captain America lives up to its hype. The film is pure entertainment at its finest. I had mentioned in my review of Priest that it’s a true shame that studios are continuing to put out poor 2D to 3D conversions. While Captain America isn’t as poor a conversion as Priest, I was still disappointed. It’s not depth that’s the issue as there is plenty of instances where there is solid depth. No, the issue lies in for every sequence that impresses (the opening or when Captain America swings his shield) the very next sequence will falter. I don’t think the problem is the source material as the 2D transfer (see below) is fantastic. It’s more that studios seemingly feel they can throw anything into the 3D machine and a solid product will result. I will admit that the image is better than the studio’s own Thor (that was too dark of an image to truly represent 3D) though. 2D-wise, Captain America excels. At first glance, this image may not be one that will impress. The film’s color palette features dull colors. After watching a few moments, it’s easy to see that the image clearly is great. Detail is spot on with accurate contrast levels as well as fine flesh tones. Nothing has been overly pumped up resulting in a pristine image. Furthermore outside opening moments, the color palette improves. Blacks are deep and inky while the red, white and blue of Captain America’s suit shines. Pausing certain moments (like that where they invade a Nazi base) showcase the fine textures on his suit. Having seen this movie theatrically, I can confidently say that this Blu-ray transfer shows the movie as intended. As a side note, the film takes up roughly 30.56GB of the BD-50 disc the feature is found on. The provided audio is DTS-HD Master Audio 7.1 and boy is it awesome! From initial opening moments to the final closing sequences, the atmosphere of this track is where the provided lossless audio really excels. Items like background effects (cars, guns, dialogue) are all delivered perfectly. The heightened action moments provide substantial LFE, but nothing overly booming….more subtle in tone. Dialogue is reproduced well via the front channel. Dynamics are top notch as mentioned. Really what works here is how well the track blends everything. Even if there’s a over-the-top action scene, dialogue is never lost, music is well balanced and effects aren’t over baring. Truly this is an exceptional track for a fine film. Marvel One-Shot: A Funny Thing Happened on the Way to Thor’s Hammer – This runs 4:03 and shows a quick film that was made about the convenience story robbery. The Assembly Begins – Running 1:46, this is a brief look into the forthcoming film The Avengers. Outfitting a Hero – This runs 10:52 and is a behind-the-scenes look at Captain America’s legendary outfit. Howling Commandos – This runs 6:07 and glances into the varying supporting characters in Captain America’s army. Heightened Technology – This runs 5:43 and looks into the “arms race” that resulted in the varying weaponry seen throughout the film. The Transformation – Running 8:50, this shows how Chris Evans will digitally transformed into a small man. Behind the Skull – This runs 10:24 and looks into the history of Red Skull. Captain America Origins – This runs 3:55 and features Captain America co-creator Joe Simon speaking on the character he helped create. Deleted Scenes – Deleted Scenes total 5:32 and are a few extended moments and a few scenes cut for length. Do note that optional commentary is available courtesy of Director Joe Johnston, DP Shelly Johnson and Editor Jeffrey Ford. Simply put, Captain America is pure fun. Even though the 3D presentation isn’t on par with the 2D counterpart, the audio and included supplements make this one worthy purchase.